New features of .NET 4.5 and WPF with code examples. I will demonstrate few new features with sample applications so we can understand the concept. Threads in .NET applications get their default culture and UI culture when it is created by Windows OS. This culture settings comes from OS's Regional and Language settings. Prior .NET 4.5 days, following piece of code is what we developers used for setting UI culture for given thread in application. Now think about multithreaded application. In multithreaded application, you have to use the code shown in Listing 1.0 for each thread/task that is created. The CultureInfo class in .NET 4.5 includes very simplified way of setting default culture and UI culture for an application domain thus saves us from writing code for each thread/task. The CultureInfo.DefaultThreadCurrentCulture property is used to set the default culture for any newly created threads, and the CultureInfo.DefaultThreadCurrentUICulture property is used to set the default culture for the UI thread. Once we set default culture and UI culture this way, it becomes applicable at application domain level and hence becomes default for every thread/task created inside that application domain. This saves us writing from redundant code of setting culture for each thread that we create. To demonstrate this, I have wired up very simple WPF 4.5 application. Since the application here is to explain the concept, I will not explain the UI part or steps to create it but will directly jump to explain important piece of code that sets default culture and UI culture. You can download the source code attached with this article to play with. As shown in Figure 1.0, the app has dropdown and it contains four different culture code en-US, es-ES, gu-IN, and ru-RU. When you select any of the culture, following code executes that creates new culture and also new thread and task. The code for NewThread method and CreateNewTask is as simple as following. It just sets Text to current UI culture’s DisplayName for newly created task/thread. When you run the sample app and select any culture from drop down, the output would be one that is shown in Figure 1.0. Note that by just setting default culture, we need not to set it for newly created thread or task. 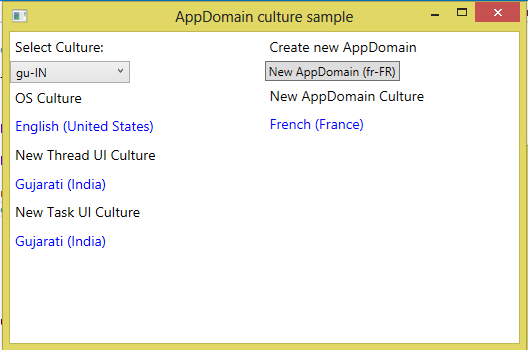 As I said that default culture is set at app domain level, let’s create another app domain with fr-FR culture. As shown in Figure 1.0, when you click on the New AppDomain button, it would execute following piece of code. As per Listing 1.3, the code creates new app domain using AppDomainSetup class. I have created AppDomainCultureInfo class to get CurrentUICulture of newly created app domain. As you can see, by just setting these two static properties DefaultThreadCurrentCulture and DefaultThreadCurrentUICulture CultureInfo, you can manage with localized cultures in multi-threaded and multiple AppDomain applications neat way. Any running WPF applications has two important threads. One thread does rendering and one for managing the user interface called UI thread. The thread which we developer deal mostly with is UI thread. Most of the WPF objects is hooked up with this UI thread. So if you do some long running task or time consuming process, UI becomes non-responsive. To overcome this, asynchronous programming model is used along with Dispatcher/background worker to do long running task in other thread and access UI element by using Dispatcher. Now there is more natural solution to this by asynchronously manipulating collection bound to UI using the BindingOperations.EnableCollectionSynchronization() method that combines a collection with a lock and allow manipulation of it without any additional code. Let’s wire up very simple application to demonstrate this concept. As per Listing 2.0, XAML markup for UI is very simple as having a ListBox control bound to MessageCollection which is of type ObservableCollection and a Button having Click event to add item to this collection from the code behind. As shown in Listing 2.1, the line BindingOperations.EnableCollectionSynchronization(MessageCollection, messageLockObject); locks the collection object with the static object messageLockObject that we created. And From button click event, we are adding string item to the collection from other thread. When you run the sample, you will see that it works fine. Now just comment the line BindingOperations.EnableCollectionSynchronization(MessageCollection, messageLockObject); and you will see that NotSupportedException is thrown. Click here to download the source code of this article.